Rancho San Lucas boasts a dramatic setting amidst the Pacific Ocean and Baja’s iconic desert backdrop. Yes, it’s set right on the southern tip of the Baja Peninsula. Rancho San Lucas, one of those luxury private resorts we all dream about visiting, is all about ocean-front living in Los Cabos. 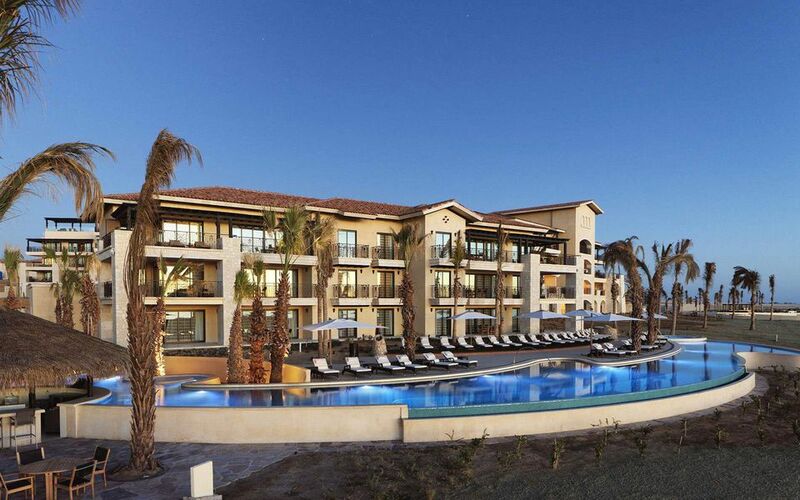 Stellar amenities include a Greg Norman-designed golf course, a state-of-the-art tennis center, all-suite accommodations, along with a plethora of dining and shopping options, all set within a Mexican-inspired pedestrian village. The 834-acre master-planned community features 12 miles of expansive white sand beachfront complemented by dramatic stands of succulent forest and has the only true ocean-front home sites in the area. This, of course, offers wide-ranging real estate investment opportunities at The Villas and The Estates– all showcasing a unique combination of Spanish and Mexican architectural elements that emphasize the balance between luxury and the natural beauty of the surroundings. The most exclusive address on the lot is The Estates with 32 single level estate homes and 36 luxury condos. The Villas are located on the highest vantage point of the development and afford spectacular ocean, golf and desert views. Even more attractive is the convenient access to trendy downtown Cabo San Lucas and the delightful Mexican ‘magic town’ of Todos Santos within a 30-minute drive, Rancho San Lucas promises an unmatched ‘best of all worlds’ lifestyle. Established in 1973, Solmar Group includes a collection of five all-suite resorts offering guests the highest quality of service and hospitality and the master-planned private resort community of Rancho San Lucas. Two of the group’s properties; Playa Grande Resort and Spa as well as the Solmar Resort and Beach Club were awarded the RCI Gold Crown Resort Award. Additionally, TripAdvisor recognized Grand Solmar Land’s End Resort & Spa among TripAdvisor’s Traveler’s Choice Awards. The property was ranked 8th among the Top 25 Hotels in Mexico and received TripAdvisor’s Certificate of Excellence.